Rapid population growth, urbanisation, rising incomes, and resource constraints are putting enormous pressure on agriculture and forests, which are crucial to food security and livelihoods. Agriculture and land use change also account for 24% of global greenhouse gas emissions. These factors together with attractive opportunities to boost investment in well-managed land use systems, make agriculture a top-priority sector for both economic and climate policy, particularly in developing countries. Agricultural productivity needs to sharply increase to keep up with food demand. The Green Revolution boosted grain yields through widely applicable technological improvements, but many of the measures needed today are location-specific, addressing issues such as drought, pests, and salt resistance. Public funding of R&D needs to increase substantially; reducing input subsidies (mainly for fertiliser and water) would free up funds while reducing waste and negative environmental impacts. Policy interventions are needed to enable and encourage smallholders to adopt new technologies and practices under more uncertain conditions. Measures to consider include targeted climate change adaptation finance, agricultural insurance schemes, and more secure property rights. Landscape-level (vs. farm-level) approaches are needed to maintain ecosystem services and overcome market failures. Demand-side measures are also needed to reduce pressure on agricultural systems. On a caloric basis, a quarter of the world’s food is now lost or wasted between farm and fork. For example, food waste reduction measures in developed countries could save US$200 billion per year by 2030, and reduce emissions by at least 0.3 Gt of CO2e. Policy-makers should also work to reduce demand for food crops for biofuels and promote a shift in diets, away from red meat especially. Special measures are necessary to prevent further deforestation and degradation of (mainly tropical) forests, especially when promoting increased agricultural productivity. Achieving zero net deforestation could result in emissions reductions of around 3 Gt CO2e per year in 2030. Payments for ecosystem services, such as under REDD+, can play a key role in this. Private-sector engagement could also play a significant role. Restoring just 12% of degraded agricultural land could boost smallholders’ incomes by US$35–40 billion per year and feed 200 million people per year within 15 years. It can also increase resilience to weather shocks and reduce greenhouse gas emissions by nearly 2 Gt CO2e per year. Initiating forest restoration of at least 350 million hectares by 2030, meanwhile, could generate US$170 billion/year in net benefits from watershed protection, improved crop yields, and forest products. This would also sequester about 1–3 Gt CO2e/year, depending on the areas restored. Agricultural and natural resource commodities have risen in value substantially in recent years, and there is also a growing recognition of the importance of the ecosystem services that forests and agricultural land provide, such as local and global weather and water regulation, carbon storage, and biodiversity. Yet around the world, ecosystems are under pressure from over-exploitation of key natural resources such as freshwater and soil nutrients. Forest degradation and deforestation are particular concerns, especially in the humid tropics. Roughly a quarter of the world’s agricultural land is severely degraded,3 and rapid urbanisation and population growth are also driving people to clear more forest land for timber and charcoal, and then use the land for crops and pasture, or for larger-scale agriculture.4 Inadequate soil and water management is exacerbated by loss of vegetative cover, and leads to water and air pollution, as well as erosion and landslides. Key ecosystem services such as water cycle regulation are being compromised, and the natural resource base is becoming less productive. At the same time, climate change is already posing enormous challenges, increasing both flood and drought risk in many places, and altering hydrological systems and seasonal weather patterns. This chapter makes the case for strategic investment and policy interventions to sharply increase agricultural productivity, reduce pressures on the land, and protect and restore forests. For developing countries, especially, the stakes are very high: if they succeed, they can grow their rural economies, lift people out of poverty, and strengthen their position in global markets – while also helping reduce climate risk and protect vital ecosystem services. If they fail, billions of their people may be unable to feed themselves adequately. We begin by examining the changing context for agriculture and forestry, including population growth, resource scarcity, and the need to both mitigate and adapt to climate change. We then review supply-side strategies to increase agricultural productivity, including new technologies and practices to increase crop yields, the role of input subsidies and other policy measures, sustainable ways to increase livestock productivity, and “landscape approaches” that boost crop yields while restoring and protecting key ecosystem services. Next, we look at demand-side measures to ease pressures on natural resources, including ways to reduce food loss and waste, alternate approaches to biofuels, and the role of dietary changes. We then examine the natural capital of forests, trends in deforestation, forest degradation, afforestation, and reforestation, and ways to scale up and accelerate positive change. Throughout the chapter, we draw lessons from success stories around the world: from Korea, to China, Niger, Brazil, Costa Rica and the United States. We end with a series of recommendations. For further discussion of some of these issues, see also Chapter 7: Innovation (biofuels) and Chapter 3: Cities (urban land use), as well as sections of Chapter 6: Finance and Chapter 8: International Cooperation. With the global population expected to grow by 1.2 billion by 2030, and the global middle class set to roughly double by 2030 from 2 billion today, pressures are increasing on food supplies and the underlying natural resource base. 5 Although the share of people living in extreme poverty has been cut in half since 1990, from 43% to 21%, 6 more than 1.2 billion people still lived on less than US$1.25 (2005$) in 2010, and more than 840 million went hungry regularly in 2012. 7 Figure 1 illustrates the breadth of global food insecurity in 2012. Yet far more growth is needed. To feed a growing and richer population by 2050, 70% more crop calories than those produced in 2006 will be needed, primarily due to changes in the developing world, including dietary change.10 The developing world is where more than 80% of the global demand growth for field crops, fibre and beverage crops, meat, and forest products, including timber, will occur over the next 15 years. 11 Meeting this new demand will create huge opportunities for businesses – from small local firms, to multinationals. Agriculture already plays a key role in many developing countries’ economies. The World Bank found that in countries in the $400-1,800 per capita GDP range (2005$), many of them in Asia, agriculture was 20% of GDP on average; in sub-Saharan Africa, it was 34%, and accounted for almost two-thirds of employment and a third of GDP growth in 1993–2005. 12Agricultural exports can provide crucial revenue to support development in poor countries, and they remain important even for large economies, from Indonesia, to Brazil, to the US. Maplecroft’s Food Security Risk Index 2013. The Food Security Risk Index has been developed for governments, NGOs and businesses to use to identify countries that may be susceptible to famine and social unrest stemming from food shortages and price fluctuations. Maplecroft reaches its results by evaluating the availability, access to and stability of food supplies in 197 countries, as well as the nutritional and health status of populations. Agricultural growth could come at a steep price, however. The global agricultural land area (including permanent pastures) grew by about 10% – 477 million hectares (ha) – over the last 50 years, 13 expanding into savannahs, prairies and forests. Tropical forests have been particularly hard-hit, losing carbon storage equivalent to 15% of global greenhouse gas emissions from 1990 to 2010. 14 Vital ecosystem services – water and air purification, flood protection, biodiversity, etc. – have also been compromised. And in some regions, there is little land left that is suitable for agricultural expansion. Water is a particular concern; the United Nations projects that half the global population will be living in areas of high water stress by 2030. 15 Climate change will further exacerbate these challenges (see Box 1). Climate change will have significant adverse effects on crop yields, livestock health and tree growth due to higher temperatures, extended heat waves, flooding, shifting precipitation patterns, and spreading habitats for pests (such as flies and mosquitos) and diseases (such as wheat and coffee rusts) that can follow even small increases in heat and humidity. Without adaptation, yields of the main cereals in developing countries are expected to be 10% lower by 2050 than they would have been without climate change. Water stress on cropping, already substantial in some areas, is likely to increase due to growing water scarcity. Both world population and average global cereals yields have exhibited fairly constant annual increments in absolute terms since 1980, which translates to a decreasing growth rate in percentage terms. Average annual percentage growth of world population and world cereals yields between 2010 and 2030 are projected to be about 0.7% per year for cereals yields in the absence of climate change, and population at 0.8% per year (U.N. medium variant). Even without climate change, global per capita cereal availability at projected yield growth rates will fall unless agricultural land expansion grows. With growing non-food demands for cereals and climate change, the pressures on land will be much worse. A range of macroeconomic modelling studies suggest that the primary impact of climate change will be on the poor in tropical countries, mainly through decreased local food supply and higher food prices. The most significant impacts are projected for Africa and South Asia, where poverty is highest, agriculture accounts for a large share of employment and GDP, and adaptation investment per capita is low. But significant parts of other regions will also be affected. Generally, the lower the capacity of people to adapt to climate shocks, the larger the negative impacts. Fears of such impacts can lead to excessive risk aversion, which can keep both people and regions locked into patterns of poverty and resource degradation. Agriculture, forestry and land use issues differ by geographic region. Farmers and forest-dependent people in higher-income countries, for example, typically have access to sophisticated insurance mechanisms, good infrastructure, supportive government institutions, investments, and policies informed by data. They are a small part of highly diversified economies with ample opportunities beside farming or forestry. Adapting to climate change and building resilience will not always be easy, but they have plenty of support and resources. The same is true of a growing number of rural people in the emerging economies of Eastern Europe, Asia and Latin America. Dealing with climate change in places with concentrations of rural poor will require programmatic approaches at scale that lower the risks for smallholder farmers and forest dwellers who pursue economic opportunities – for example, by engaging with markets instead of focusing only on subsistence food production. Some of these measures can produce “triple wins” of higher productivity, greater resilience, and increased carbon sequestration, as will be discussed later in the chapter. They require tailored institutions and safety nets, however, appropriate for low-income, low-density, and low-infrastructure conditions. There are clearly compelling reasons to invest strategically in the agriculture and forestry sectors, particularly in developing countries. The sections that follow explore a number of opportunities to boost agricultural outputs. Many of these measures would also ease pressures on natural resources, reduce GHG emissions and make farming systems more resilient in a changing climate. The Green Revolution has transformed agriculture around the world, but many farms in the developing world are still operating well below their economic potential. If we are to launch a second Green Revolution, however, it will need to address the extra constraints imposed by a degrading land base, water scarcity, and other drought- and heat-related issues. Often the problems will be very location-specific, such as increasing salinity from waterlogging or ocean intrusion, or particular pests or plant or animal diseases. Success can have major impacts on regional development and land use change, as shown in Box 2 for soybean development in the Brazilian Cerrado. The Cerrado biome of central Brazil was traditionally considered unfit for large-scale agriculture due to its poor, acidic soils. The Brazilian agricultural innovation system developed soybean varieties resistant to aluminium and to the tropical climate in the 1960s and 1970s. The new varieties could achieve yields two or three times larger than those in southern Brazil. Cultivation of soybeans in central Brazil soared after 1970, leading to a roughly 40% increase in labour and land productivity in the region from 1970 to 1985. It induced shifts in land use from pasture to crops, and linked the region to international markets at a time when global demand for soybeans was growing rapidly. The new technologies required more skilled labour, requiring intensive use of fertilisers and mechanisation. This accounted for 30% of the increase in educational attainment in the region from 1970 to 1991, through both local knowledge transfer and in-migration. On the flip side, the first official Brazilian government survey of the state of the Cerrado using satellite imagery found that some 47% of the natural vegetation had been lost by 2008. This inevitably has serious consequences for loss of carbon and biodiversity from a places in the world that has traditionally been considered highly biodiverse and carbon-intense. There is no free lunch. Globally and in specific regions, rapid advances in biological sciences are opening up great possibilities for developing new, more productive and resilient crop varieties. New technologies are making it possible to quickly screen huge volumes of material for desired traits and then to cross-breed them into seeds, revolutionising the business.27 Breeders have developed methods for mapping and labelling portions of plant DNA associated with useful traits such as drought tolerance or pest resistance. This permits identification before a plant has grown of those seedlings that are most promising for further breeding. A key collaboration focused on tropical food crops is the Consultative Group on International Agricultural Research (CGIAR), a US$1 billion-a-year global agricultural research partnership involving 15 research centres. CGIAR centres were instrumental in the original Green Revolution. They bring together high-level scientific capacity, significant funding, and institutional memory on developing-country agriculture and natural resource management. This enables them to provide farmers with vital science and technology support. SRI is very labour-intensive, however, and requires precise knowledge and timing, as well as reliable water access on demand. It is also likely that SRI is only suited to specific locations, so the opportunities for scaling it may be limited.33 This and Scuba rice are examples of how the next Green Revolution is likely to require more location-specific approaches than the original Green Revolution. This will place even heavier demands on national agricultural innovation systems for varietal development, capacity-building, and communication with farmers. With some crops, such as maize and wheat, the private sector may play an important role in innovation, as there is a market for hybrid seed, and research on these crops may also have more global (rather than region-specific) applications. However the returns to deploying new technologies on the small farms that predominate in most of Africa and Asia are low, and access to credit is often difficult. Thus there is also a need for public support for scaling-up these commercially viable technologies in some regions or with some farms. For the major cereals, research programmes supported by the CGIAR are critical, especially as traits that will enable adaptation to climate change are added to those being sought. The returns on agricultural R&D can be substantial. An independent meta-evaluation of CGIAR-financed food crop research in developing countries from 1971 to 2007, worth US$7 billion in 1990 prices, found it had “significantly demonstrated and empirically attributed” minimum benefit-cost ratios of 2:1, and “plausible extrapolated” benefits of up to 17:1 overall.40 There is considerable scope to increase funding for agricultural R&D to increase productivity and resilience, whether through multilateral, regional or national institutions. The situation in sub-Saharan Africa is different, however. There, synthetic fertiliser use in 2013 was estimated at 9-10 kg/ha, compared with an average of 150 kg/ha in Asia.50 Only about 6% of the crop area in Africa was irrigated in 2011, compared with 48% in Asia.51 A number of countries in Africa have subsidised fertiliser in an attempt to increase usage, and this can help under some conditions, where use is limited by volatile international fertiliser prices, low commercial development, thin input markets, lack of knowledge, illiquidity, etc., and there are clear exit strategies. 52 However, the same analysis also suggests that the reasons for low usage are often more complex than temporarily high purchase prices or missing financing that might be addressed by subsidies, and that the opportunity cost of subsidies can be large, as other investments might better address the underlying problems. There are four significant pathways for achieving economic growth from livestock production. The first three also have the benefit of mitigating GHG emissions. The fourth mitigates livestock emissions only if it is combined with one of the first three. 1. Promoting more efficient beef and dairy production to meet growing demand for beef and milk will increase incomes and use fewer resources per unit of output to produce it. There is an important and scalable opportunity for increasing the productivity of cattle and dairy operations on large areas of pasture in Latin America, especially Brazil, where pasture productivity is estimated to be currently only at one-third of potential. 58 There are also large variations in the efficiency of pasture use across farms within ecological regions of Brazil – in fact, larger on average than between regions. 59 Treating pasture with lime and fertiliser, introducing improved grass, legumes, and leguminous shrubs, improving health care, and adding shade trees could boost productivity to at least half of potential, enabling a 50% increase in cattle exports. 60 These technologies will have considerable latitude to spread as beef continues to rise in price. However, it will also be critical to ensure that any adjacent common land is not illegally cleared for beef as a result of increased profitability. 61 This pathway would also decrease GHG emissions per unit if pursued in conjunction with the second pathway. 2. There is significant scope for reducing per unit ruminant emissions while improving efficiency of production. 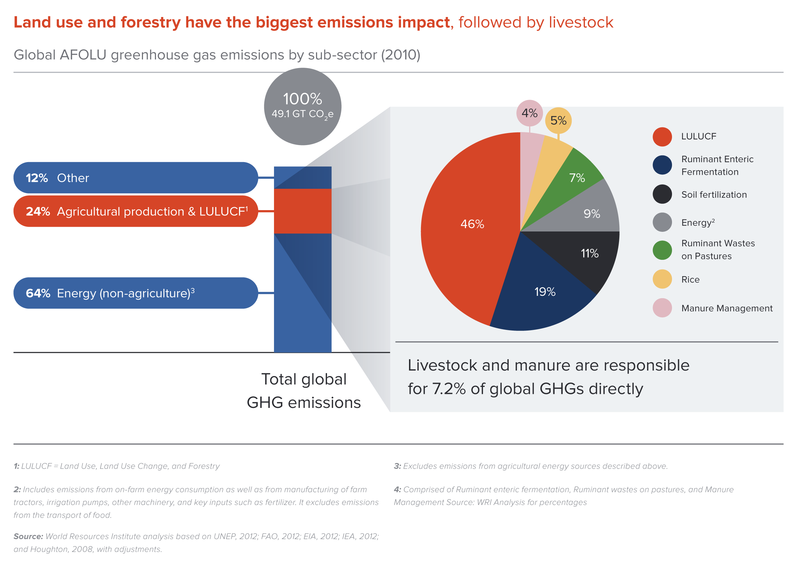 There are already large differences across regions: a kilogram of beef produced in Eastern Europe generates 14 kg of CO2e GHG emissions on average, compared with 77 kg in South Asia and 29 kg in North America. 62 Within individual regions and farming systems, it has been estimated that if the bottom 75% of producers in terms of GHGs adopted the practices of the top 25%, global GHGs could be lowered by 0.2–1 billion tonnes of CO2e, depending on the price of carbon. 63 There are several existing options for improving the quality and digestibility of forages and fodder, reducing emissions of enteric methane and improving daily weight gains, so animals can be brought to market sooner. Technologies with the most potential are feed additives, forage management (including new introductions and rotational grazing), increased efficiency in the age structure of herds, and breeding. 3. Increased efficiency in producing pork, poultry and eggs would save resources and help shift relative price incentives to favour less GHG-intensive meats. Pork and poultry are less GHG-intensive than beef and mutton, and lower prices and higher quality could encourage a shift in consumer demand. 65 The “Livestock Revolution” of the 1980s and 1990s mostly transferred industrial-grade pig and poultry production systems and genetics from the US and Europe to developing countries through private-sector investments; the latter were made profitable by rapidly rising local demand and relatively cheap feed grains. This also helped shift meat consumption in developing countries in relative terms, to a larger share of grain-fed poultry and pork instead of grass-fed mutton and beef. 66 There is scope to further reduce supply-chain transaction costs to increase productivity and facilitate market access for pork, poultry, eggs, and other lower-GHG animal protein sources. 4. Producers in emerging and developing economies would benefit from being able to sell livestock products to high-value markets through one of the major multinational groups, particularly given the concentration of the global meat industry in recent years. If these multinational enterprises emphasise reducing the GHG emissions associated with their meat sourcing, as seems likely to happen, countries that wish to benefit from this growth pathway will also have an additional incentive to pursue the first three. A trend is emerging where developing countries can add value to livestock production by developing the sanitary and environmental credentials needed to attract both orders and investment from major international firms. Only one-tenth of meat production is traded internationally by weight, compared with more than one-third of even more perishable fish.71 This is largely due to the sanitary (distinct from food safety) issues discussed in Box 3. Meat trade has nonetheless grown by 40% in the last decade, 72 and pressures are building for changes in both technologies for disease control and regulations. At the same time, the global meat industry is increasingly concentrated: the top 10 meat-centred multinationals had revenues approaching US$200 billion in 2013. 73 Three of these were also members of the Consumer Goods Forum (CGF), an industry association representing roughly 400 of the world’s largest retailers, manufacturers, and service providers with combined annual sales of €2.5 trillion, with a proven interest in promoting food safety and environmental sustainability in their supply chains. Being a competitive supplier to this kind of firm will thus require investments in food safety and sustainability, many of which can be addressed via the other three pathways discussed above. A major market barrier, and one that hampers the scale-up of more efficient production techniques, is the fact that globalisation has led to the rapid transmission of animal disease across borders. For example, an Indian variety of foot-and-mouth disease was associated with more than £8 billion in public- and private-sector losses in the UK in 2001.74 And of the thousands of diseases known to affect humans, about half are thought to be transmissible between livestock and humans, or “zoonotic”. Well-known examples are avian influenza and SARS, but there are many others. Disease concerns and associated animal health barriers have segmented global meat markets into “disease-free without vaccination” and “with vaccination” categories.75 The latter countries cannot export livestock or livestock products to the former countries under current regulations, which typically limits exports from developing to developed countries and even within groups of developed and developing countries. Globalisation of markets is creating new pressures to move animals and animal products across borders, with new concerns also emerging about disease transmission. Climate change itself will also help redraw the distribution of diseases as fungi, parasites, and insect vectors expand into new habitats. This is no longer just a matter of interest to traditional meat exporters; Indian beef shipments nearly tripled between 2008 and 2013, and India is now the world’s second largest beef exporter, with a one-fifth global market share by weight. India is also the fourth largest exporter of eggs. How vaccines are developed for key diseases will be critical for determining how markets develop. The fact that an animal is vaccinated under current technology significantly lowers its potential market value in international trade. Collective action across a rural landscape can also be crucial. In many cases, the negative impacts of unsustainable practices on one farm can spill over, such as when a farmer cuts down the trees at the top of a slope, affecting the flow of water to farms at the bottom. Conversely, planting trees at the top of the slope could achieve “triple wins” at the landscape level, but not fully pay off for the farmer who planted them. To encourage such actions, there is a need for solid institutions and leadership to ensure that losers are compensated, and that those who need to take action have incentives to do so. Many “climate-smart” interventions involve trees – planting trees on farmland (for fruit, timber, shade, soil improvement, and other purposes), and/or restoring and protecting forests around agricultural areas. Trees play a crucial role in producing the ecosystem services needed for agricultural productivity and resilience, and a growing body of agroforestry research and practical experience is showing the economic benefits of greater collaboration between the agriculture and forestry sectors. Forest conservation and restoration will be discussed in greater depth in subsequent sections; here we focus on landscape approaches that use trees through agroforestry as part of an overall strategy to improve agricultural productivity and build resilience. 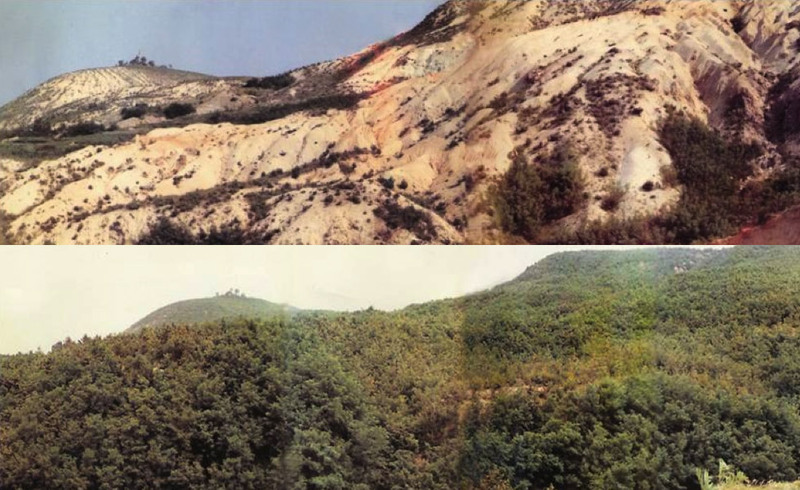 Agricultural landscape restoration might also include mosaic restoration of forest at the top of steep slopes to hold soil, retain water, and provide windbreaks; this topic will be dealt with in more detail in the forest section. Niger offers a prime example of a successful landscape-level intervention combining improved land and water management with agroforestry. Roughly 60% of Niger’s population lives on less than US$1.25 (2005$) a day, and most farms there are very small. Since the 1990s, farmers in the Maradi and Zinder regions have interplanted nitrogen-fixing trees on cropland, or allowed roots and stumps to regenerate, increasing tree and shrub cover 10- to 20-fold. The strategy has significantly increased agricultural productivity on 5 million ha of farmland, and helped restore at least 250,000 ha of severely degraded land that had been of little use for agriculture or forestry. Sustainability also increased, as at least one-quarter of producers in the area adopted improved natural resource management techniques. 81 Biodiversity was expanded and soil fertility improved measurably in the entire area. Thus, some of the world’s poorest people became substantially better off. Recent evaluations have found that farmers in the affected regions of Niger now regularly produce at least 100 kg/ha more grain than previously, other things equal, about 20% of 2010 grain yields in the zone, 82 and even twice as much as before with micro-dosing of fertiliser. Gross real annual income in the region has grown by US$1,000 per household for over a million households, more than doubling real farm incomes and stimulating local non-farm services. 8384 Yet all of this required only modest additional government spending or business investment. The main driver was revised legislation on tree ownership; giving farmers more control of the resource provided them with incentives for better care of the trees and sustainable partial harvesting of branches, which allowed the trees to keep growing. To tackle the challenge, the Chinese Ministry of Water Resources and the World Bank worked together to produce two watershed rehabilitation projects spanning 1994 to 2005, and between them mobilised US$298 million in Bank funds and US$193 million in Chinese government funding. The key elements of the projects were to halt the activities that led to degradation, in particular planting on steep slopes, tree-cutting, and free-range grazing of goats, and to actively encourage regeneration. Land tenure responsibilities and benefits were clarified. Earth-moving equipment was brought in to replace the farmers’ hand-dug terraces, which crumbled each year, with more stable terraces three or four times as wide (6–12 metres). Land that was unsuitable for grain production was planted with trees or shrubs instead, or allowed to grow wild again, resulting in large-scale reforestation and grasslands regeneration. To ensure local buy-in and sustainability of the projects, farmer groups and county-level government entities were fully engaged in decision-making and implementation. One challenge is the political support that ensures stakeholder participation and collaboration, and ultimately facilitates funding access. This was vital in the Loess Plateau, where winners and losers needed to be identified and benefits redistributed to overcome resistance to the initiative. Funding for integrated landscape investment will also be essential, including from the private sector, to achieve the scale needed. A recent review supported by the United Nations Environment Programme (UNEP) examined 29 integrated landscape initiatives and 250 financial institutions that support landscape approaches in agriculture.95 The review identified finance provided by public and private financial actors, from NGOs to investment banks. Almost all cases involved public-private partnerships, and in most cases, the private sector recognised that returns would be positive, but lower than if social and environmental benefits were fully compensated in the marketplace. On the other hand, these partnerships created trust and helped firms resolve serious local problems such as upstream water pollution by smallholders, which otherwise could affect their operations. The International Platform for Insetting (IPI) was pioneered by Vittel in France to try to overcome some of the financial and technical knowledge constraints for landscape investment in developing countries. It operates where there is potential to create significant shared value with smallholder farmers through higher-value crops such as coffee, cocoa, fruits, flowers and rubber, or where there is a need for ecosystem services such as clean water. Unlike companies that buy carbon offsets, these companies work directly with farmers to integrate measures to reduce GHGs or provide ecosystem services into their own operations. Projet Pur, an international collective based in France, provides implementation support to companies in the field. 96 The Nestlé example above is an IPI “insetting” activity implemented in conjunction with Projet Pur. IPI is relatively new, but it is already working with five major corporations around the world. Increasing food security is not just about increasing food supply; it is also about reducing inefficient or unnecessary demand for food crops and livestock. Three key demand-side strategies can reduce economic costs while benefitting the climate: reducing food loss and waste, reducing biofuel demand for food crops, and shifting toward more healthy diets. At the global level, in order to scale up food loss and waste, governments and companies need to start by consistently measuring where and how much food is being lost or wasted within national borders and along food supply chains. What gets measured gets managed. Second, governments, intergovernmental agencies and companies need to increase investment in low-cost, low-emission technologies for storing food in low-income and middle-income countries, and in improved food inventory systems everywhere. For example, farmers in West Africa are beginning to make widespread use of airtight, reusable plastic storage bags to prevent insects from damaging cowpeas. These farmers have seen an average increase in cowpea-related income of 48%, and cowpeas that had been stored in these bags generally fetch a price 5–10% higher than those stored by other methods due to higher quality. 107 Similar approaches are being used for in-village grain storage in the Sahel. Third, food retailers need to push their suppliers to squeeze waste out of their food supply chains and educate consumers on how to avoid wasting food at home. The UK’s leading food retailers are already showing how this can be done. Some may be concerned about lost sales, but recent studies in the UK indicate that consumers who reduce their household food waste are “trading up”, spending about half of their savings on higher-value – which often means higher-margin – foods in the store. 108 Finally, more food that now goes to waste can be put to good use if governments in high-income countries support “Good Samaritan” laws and/or tax breaks to facilitate or encourage donations of excess food by restaurants and supermarkets. Reducing food loss and waste at scale will generate significant benefits. In developing countries, reducing losses near the farm can increase net farmer incomes, make more food available locally and even nationwide, make the country’s agriculture sector more competitive, and help combat poverty – while reducing pressure on the natural resources used in farming. In developed countries, reducing food waste can improve profit margins for food retailers and restaurants, save households money, and reduce waste management costs. Another demand-side opportunity concerns biofuels. Liquid biofuels – ethanol and biodiesel – provided 2.7% of the world’s transport fuel in 2010, and consumed nearly 5% of world crop production in terms of energy content. 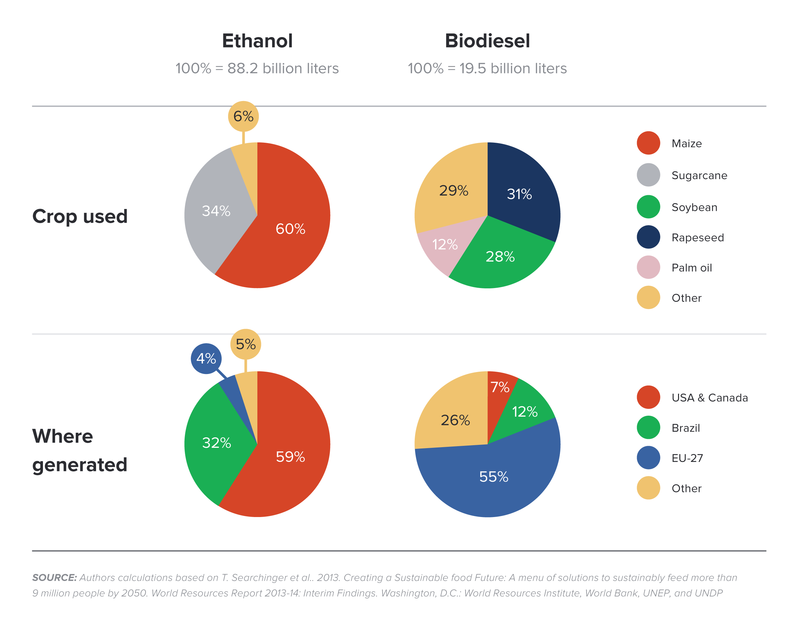 109 Feedstocks for “first-generation” biofuels – which make up almost all the supply – are primarily major food crops, in particular maize, sugarcane, rapeseed (canola), and soybeans (Figure 4). Yet more than 30 nations have established, or are establishing, targets and mandates that call for a greater share of their transportation fuel to consist of biofuels.120 Many of these targets hover around 10%. If such a target level were global by 2030, then meeting it with first-generation biofuels would require 23% of current crop production in energy terms.121 The International Energy Agency (IEA) estimates that if the entire global biomass harvested as food, feed, forage and timber in 2000 were converted to bioenergy under current technologies, it would only meet 20% of world energy needs in 2050.122 Clearly such targets cannot be met with first-generation technologies, and should be based instead on waste materials and third-generation biofuels. Second-generation biofuels have been under development for many years, and rely on non-food biomass. The feedstocks include cellulose-rich plants and trees, agricultural by-products and food waste. Initially, development focused on using cellulose-rich plants and trees grown on natural resources that would also be suitable either for food production (crops) or carbon sequestration and biodiversity (forests). Attention has turned in recent years to using food waste (especially used cooking oil), paper, scrap wood, maize stover (leaves and stalks left after harvesting) and sugarcane bagasse (the fibre left after processing the stalks) as feedstock in biofuels, aiming to minimise both financial costs and drains on additional natural resource use. However, commercial viability to date has been limited in the absence of subsidies. Like other renewable energy sources, second-generation biofuels using wastes are likely to require transitional support for a number of years to scale and become competitive across a wider set of markets. A recent report estimated that such waste-based biofuels could technically fuel up to 16% of all European road transport by 2030. 123 This is based on a finding that Europe has 220 million tonnes of truly unused wastes which, if used for biofuels, could displace 37 million tonnes of oil used for fuel, and on a net basis decrease GHGs that would have come from equivalent fossil fuel use by 60%, while adding €15 billion to the rural economy. Uncertainties remain, however, on technologies yet to be scaled up commercially and their need for subsidies. One third of all food produced in the world ends up as waste, while the value of that global consumer food waste is more than US$400 billion per year. As the global middle class expands over the course of the decade, the cost could rise to US$600 billion. A 20-50% reduction in consumer food waste could save between US$120 and 300 billion per year by 2030, according to a contributing paper for the New Climate Economy, conducted by WRAP (The Waste & Resources Action Programme). Strategies to achieve economic and environmental gains by reducing food waste, identifies significant opportunities to improve economic performance and tackle climate change by reducing the amount of food that is wasted in agriculture, transport, storage and consumption. By 2030 global GHGs could be lowered by at least 0.2 and possibly as much as 1 billion tonnes CO2eq per year through food waste reductions, more than the annual emissions of Germany. Practical changes, such as lowering the average temperatures of refrigerators or designing better packaging, can make a considerable difference in preventing spoilage. Approximately 25% of food waste in the developing world could be eliminated with better refrigeration equipment. Yet the value generated by agriculture in former forestlands and by the extraction of forest products also brings costs. Forests are an important form of natural capital, generating economic returns (and climate benefits) for countries, companies and citizens. The ecosystem services that forests provide are especially important to the resilience of agricultural landscapes. For example, clearing of trees upstream and upslope creates significant erosion issues, leaching of nutrients, and water problems downstream and down slope. Thus, protecting remaining natural forests and restoring forest cover – globally and in individual regions – is a key part of feeding the world and building a resilient economy. It will become even more important as we intensify agriculture to boost crop yields and increase food production. In other words, we will need to “produce and protect” at the same time (see Box 4). Like agriculture, which produces consumer goods (and a few intermediary products) for sale, forests can yield goods for markets, such as timber. As is the case with agriculture, increasing demand for forest products can increase pressures on land resources, although to an extent technological or organisational innovations can help to meet increased demand while minimising GHG emissions. However, for forests, the greatest economic value generated is not from products but from ecosystem services, most of which are not currently traded in markets. Leading forest specialists and economists estimate that conserved and sustainably managed forests generate more than US$6,000 per ha per year in aggregate value, with values varying between forests and coming mainly from non-remunerated ecosystem services.133 The preponderant importance of non-market ecosystem services, combined with the long time period required to regenerate forests, imply the need for institutions and actions to internalise the net social value of forests for all who impact on them. Agricultural growth need not depend upon or trigger deforestation, if agricultural intensification is complemented by forest protection policies. The experience of Brazil provides an important example. Since 1970, crop yields in Brazil have quadrupled and livestock productivity has doubled. Brazil is presently among the three largest global producers of sugarcane, soybeans and maize, and plays a major role in the global value chain for beef. This boom in productivity is the result of many factors, including investment in the national agricultural research agency, advances in soil improvement and crop breeding, expanded agricultural credit, and rural infrastructure. During the 1990s through 2005, however, this agricultural growth was linked with very high rates of deforestation. Productivity gains alone were not sufficiently relieving pressure to convert forests, particularly the Amazon. Complementary strategies that made clearing the forest frontier economically, legally and/or reputationally “expensive” were needed. And they came in the mid-2000s in the form of technology-enabled transparency on forest clearing activity, backed by law enforcement and agricultural finance conditioned on compliance with anti-deforestation policies. The impact was significant. The rate of deforestation in the Brazilian Amazon fell by 76% between 2005 and 2012 – although there was an uptick in deforestation in 2013. During the same time period, production (by tonnage) of Brazil’s major agricultural commodities increased as well. Soybean production grew by 29%, sugarcane by 70%, and beef by 8%. Forests – ecosystems dominated by trees – today span about 4 billion ha and occupy about 31% of Earth’s land area excluding Antarctica. 134 They are home to 350 million people around the world, while 60 million indigenous peoples almost wholly depend on them for their livelihoods.135 And they are critical to everyone for the forest products, watershed protection, carbon storage, and other benefits they provide. Timber and pulp. Many forests are actively managed to yield timber and pulpwood. The economic value of industrial roundwood production, wood processing, and pulp and paper production amounted to US$606 billion in 2011. 136 If sustainably managed, forests can continue to provide these products for generations to come. Global climate change mitigation. Forests play a significant role in the global carbon cycle and thus in regulating the world’s climate (Box 5). During the process of photosynthesis, trees absorb carbon dioxide from the atmosphere. Some of this carbon gets stored in branches, trunks and roots, while some ends up in the soil as leaves and other parts of trees decay. 153 The world’s forests absorbed an amount of CO2e equal to about half of the fossil fuel emissions in 2009.154 On average, forests can store up to 32 times more carbon in live biomass than grasslands or croplands.155 Forests are thus at the front lines of minimising the economic risks of climate change. Forest trees and other vegetation actually remove carbon (in the form of CO2) from the atmosphere, providing substantial climate benefits. According to one study, stopping all tropical deforestation and forest degradation could reduce carbon emissions by 5.14 gigatonnes (Gt) of CO2e per year.156 For comparison, emissions from fossil fuel combustion and industrial processes in 2010 have been estimated at 32 Gt CO2 (±2.7).157 Second, allowing all secondary forests and fallow lands from shifting cultivation systems to continue growing would sequester another 3.7 to 11 Gt CO2e per year out of the atmosphere and store it in regrowing forests. Finally, re-establishing forests on 500 million ha of land that once supported them could theoretically provide an additional global carbon sink of about 3.7 Gt CO2e per year if the annual accumulation of carbon in trees and soil were a modest 2 tonnes of carbon ((or 7.34 t CO2e) per ha per year. Thus, implementing these measures could get us a long way towards stabilising the concentration of CO2 in the atmosphere. However, these figures reflect only the estimated biophysical potential. They do not factor in the opportunity costs of land in a world demanding more food and wood, nor the relative ease or difficulty of implementation. Nonetheless, more sustainable management of the world’s forest resources is a mitigation strategy that can be implemented now, and can thus lead to near-term emission reductions as we wait for emission reduction technologies in other sectors such transportation and energy to develop and evolve. Finally, forests support more than half of the world’s biodiversity. 160 While biodiversity has its own intrinsic value, it is also the storehouse of the genetic information for the planet which underpins many of the other benefits described above and is the basis for resilience to future climate change, diseases, and other phenomena that might affect humankind. A suite of interlinked factors is driving the decline in forest capital. 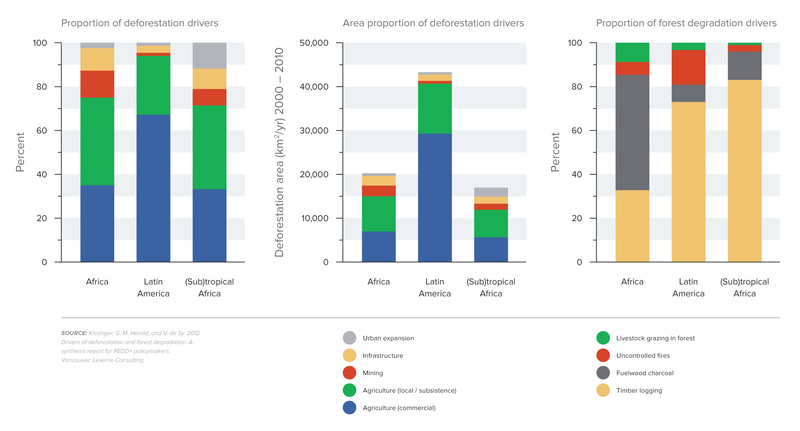 Proximate causes include agriculture (clearing for both crops and livestock), timber harvesting, extraction for fuelwood or charcoal, mining and road-building.170 In the tropics, commercial and subsistence agriculture are the leading drivers of deforestation, while timber and fuelwood extraction are the leading drivers of degradation (Figure 5). Behind this is the increasing demand for forest products from a rising population with rising consumption. The underlying causes are a number of market and governance failures. For instance, market prices, tax policies, lending conditions, and commodity procurement practices often do not reflect the wider economic value of a forest. In economic terms, these benefits are not “internalised” by the market. These shortcomings are compounded by the fact that decisions about the fate of a forest are often made in the absence of good information, in a non-transparent manner, and without adequate accountability. In some places, corruption and powerful vested interests hold sway, institutions are weak, and the rule of law is not enforced.171 And in some places, local people who live in and near forests have weak or no property rights regarding forests or the benefits derived from forests.172 Any form of capital – whether natural, financial or human – needed to underpin strong economic growth cannot be enhanced and utilised effectively under such market and governance failures. Conserve: Avoid deforestation and degradation in remaining natural forests. Sustain: Manage some forests – both natural and plantation forests – to yield timber, pulp, and other goods in a manner that is sustainable socially, environmentally and economically. Restore:Restore some of the world’s degraded and lost forests into natural forests through active restoration and/or passive regeneration methods. If effectively implemented, the combination of these approaches would enhance forest capital, helping drive economic growth while combatting climate change. And history indicates that forest recovery can go hand in hand with economic development. During the latter half of the 20th century, for instance, South Korea’s forest cover nearly doubled while its economy grew more than 25-fold in real terms. 173 Between 1986 and 2005, Costa Rica’s forest cover increased nearly 20% while its economy grew 2.5-fold in real terms. 174 Of course, numerous factors were involved with these economic transitions, and cause-effect relationships between factors are complex. Still, these examples show that deforestation is not an inevitable part of economic growth. Reducing Emissions from Deforestation and Forest Degradation plus (REDD+) finance. As is the case with cities and energy, many of these strategies harness one or more of the three key drivers of change. Improving land use planning processes is a means of raising resource productivity, in this case land use productivity. REDD+ finance and payments for watershed services are a form of increasing infrastructure investment, in this case investment in the natural infrastructure of forests. Innovations in information and communication technologies are enabling never-before-possible transparency about forests, while zero-deforestation supply chains are an innovative new business model with great potential.Underlying these drivers of change is the potential for improvements in tenure and law enforcement – institutional conditions that set the context for how forests are managed. Secure tenure – the assurance that the rights, rules and institutions governing the conditions of access and use of the land and its forest resources will be respected by government and society – is an important precondition for motivating people to invest in conservation, sustainable management, or restoration of forests. Individuals, families, or communities are unlikely to invest if they do not have clear rights to, or ownership, of that land, if that land can be taken away from them without due process and fair compensation, or if they do not have rights to any of the benefits of trees on that land. Providing legal recognition of indigenous and local community rights to forests and supporting the integrity of these rights would be a low-cost way for a government to avoid deforestation and unnecessary conflict when it comes to natural resource management. 181 Ways that governments can support these rights include mapping community forest boundaries, helping expel illegal loggers, and not granting commercial concessions within community forests. Good land use planning can help optimise how land is used, encouraging agriculture in highly productive areas and prioritising forests in areas in need of watershed protection, having high forest-dependent local livelihoods, and other factors. Tools for land use planning include forest zoning (e.g. designating protected areas), tax incentives, and more. 183 Good land use planning provides clarity around procedures and land classifications, which can lower transaction costs and provide certainty to businesses and landowners. But in order to generate these impacts and avoid corruption, planning processes need to be transparent and participatory when being developed and enforced once approved. Law enforcement is an important strategy because it addresses some of the underlying governance failures and because of its potential scale of impact. Well-executed law enforcement can affect an entire country’s forests. It has long been recognised that transparency regarding the physical state of forests and decision-making about forests is a critical foundation for any effort to conserve, sustain and/or restore the natural capital of forests. Recent advances in technology have the potential to amplify the power of transparency. The convergence of low-cost satellite imagery, cloud computing, high-speed internet connectivity, smartphones and social media is ushering in a new world of “radical transparency” where what is happening in a far-away forest can now be known close to home. Exemplifying this convergence, the Global Forest Watch system now makes it possible for anyone freely to identify changes in forest cover anywhere on the planet at relatively frequent time intervals. This level of transparency is vital for the successful implementation of other strategies described in this chapter. For instance, it enables monitoring and verification in pay-for-performance PES finance. It enables commodity buyers and suppliers to demonstrate adherence to supply chain commitments. And it provides the information needed for better land use planning and effective law enforcement. Technology-enabled transparency is an important strategy in part because its scale of impact is substantial. All of the world’s forests now have a level of transparency that they have never had before. It is also important because it helps tackle the governance failures that prevent the full realisation of forest’s natural capital. Transparency can trigger accountability, deter corruption, and empower better-informed decision-making. Increased transparency is leading to increased corporate supply chain pressure to curtail deforestation. Because many customers and employees of companies care about forest conservation, being associated with deforestation can negatively affect a company’s brand value, sales, and employee morale. And a company’s brand image can constitute a large share of its corporate value. 191 Recognising this connection, some companies have taken steps to leverage their supply chain power to disassociate their business activities from deforestation-related commodities. The zero-deforestation supply chain model is an important strategy because it addresses both market and governance failures affecting forests. To the degree that buyers follow through on their commitments, the financial flows of commodity purchases will be aligned with sustaining forest capital. And the procurement practices will necessitate heightened transparency and accountability. This supply chain model is also important because it has the potential for impact at a large scale. The CGF consists of 400 of the world’s leading consumer goods manufacturers and retailers from 70 countries with combined annual sales of €2.5 trillion. 195 Its members reach deep into the global supply chains that most affect the planet’s forests. Together with the CGF, a number of banks have also engaged in a Banking Environment Initiative 197 to support consumer companies in their efforts to reduce deforestation through a Soft Commodities Compact. The Compact commits banks to work with consumer goods companies and their supply chains to develop appropriate financing solutions that support the growth of markets producing timber products, palm oil, soy and beef without contributing to deforestation. Eight banks had adopted the Compact as of mid-2014. Payments for ecosystem services (Box 7) monetise some of the economic benefits that forests provide beyond those traditionally traded in private markets (e.g. timber). One form of payment gaining traction relates to investing in forests as a low-cost means of securing stable, clean freshwater supplies. Leaders of New York City, for example, opted in the 1990s to conserve and restore forests in upstream watersheds that supplied the city’s drinking water instead of investing in building an expensive new water filtration system. In so doing, the city saved $6.5–8.5 billion while securing long-term, clean drinking water supplies. 198 Others are following suit, including cities such as Quito, Ecuador; São Paulo, Brazil; and Bogota, Colombia. Investments in watershed protection upstream of Bogota are projected to save the city US$35 million over the course of 10 years. 199 In essence, these payments for watershed services recognise forests as a form of natural infrastructure that can be lower cost than the traditional concrete-and-steel “grey infrastructure” of water filtration, water storage, and related technologies. More than 300 payments for ecosystem services (PES) programmes have been established worldwide to support biodiversity, watershed services, carbon sequestration and landscape beauty. PES are arrangements whereby users or beneficiaries pay a provider, such as a farmer, for the ecosystem services from which they would like to benefit. Some are driven at the international level (e.g. REDD+), others at the national level, and others at the local level (e.g. payments for watershed services). The payments can be made by governments, development banks, or by private actors (e.g. beverage companies that pay upstream landowners to manage the land in ways that maintain downstream water quality and flow). PES are estimated to channel more than US$6.5 billion annually through national programmes in China, Costa Rica, Mexico, the UK and the US. However, in order to be effective, PES schemes require clearly defined property rights; clearly defined goals and objectives; monitoring and reporting; good enforcement; and approaches to ensure that the ecosystem benefits go above and beyond what would have occurred without PES, that they are long-lasting, and that they don’t simply shift environmental damage to another location. Curbing forest loss in low- and middle-income countries will require a concerted effort along three tracks. First, governments must implement sustainable land use reforms that are in the long-term interest of its economy and its people. Second, the private sector, especially global commodity sellers and buyers, must implement zero-deforestation policies and create demand for sustainable supply. Third, the international community must support both transitions through REDD+ payments – i.e. payments for verified reductions in forest emissions. Some level of conserving, sustaining and restoring forests will be in the self-interest of governments, communities and companies in most cases, at least in the medium to long term. But this is unlikely to be sufficient to motivate the economically efficient level of investment in forest capital on its own, for two reasons. First, political economies in low- and middle-income countries often favour resources extraction in the short run. Second, a critical portion of the benefits provided by forests are important global public goods in nature, including carbon sequestration. International financing and support, such as through REDD+, will be required to close the near-term gap and shift the political equation. REDD+ can help defray opportunity costs when shifting away from business-as-usual forest practices. If designed well, REDD+ programmes can help farmers and forest-dependent people adopt new practices that conserve, sustain and/or restore forests. In most cases, forest loss is driven both by market failures – primarily the lack of valuation of the global carbon externality – and governance failures. When REDD+ was first introduced, most attention was given to the market failure. REDD+ payments were seen as a necessary financial tool to internalise the global carbon externality to match the opportunity cost of private landowners behaving rationally in functioning markets. In other words, REDD would “outcompete” profitable production that damaged forests and cause a shift away from business-as-usual forest practices. If designed well, REDD+ programmes can indeed help farmers and forest-dependent people adopt new practices that conserve, sustain, and/or restore forests. In most cases, however, REDD+ payments will not need to fully compensate the private opportunity costs of individuals or companies that wish to fell trees for timber or agricultural land. Rather, the most important function of REDD+ payments is arguably to deal with the governance failures. REDD+ should be seen as a transitional tool to strengthen reforms intended to implement sustainable land use policies and ramp up law enforcement. It is cheaper to clamp down on illegal logging or redirect agricultural expansion to degraded lands than to pay off those causing deforestation. Seen this way, even relatively small REDD+ payments can cover the “political opportunity costs” and help strengthen the hand of reformers within public authorities to overcome vested political and economic interests to promote good governance and the rule of law. This, in turn, can increase the legal, market and reputational “cost” to those who deforest, and create a level playing field for sustainable producers. REDD+ finance can thereby help facilitate the politically and sometimes financially costly transition toward public policies and private practices that build forest capital. Most REDD+ financing thus far has focused on technical assistance, getting countries “ready” for larger-scale action. Areas supported include assessments of drivers of deforestation, economic impact studies, drafting national strategies and consulting key stakeholders, setting emission reference levels, developing forest and emissions monitoring, and designing payment and benefit distribution systems. Such capacity-building has been important and will continue to be needed in some countries that lack the capacity to manage conditional cash transfer programs at an operational scale. Going forward, however, REDD+ financing will need to increasingly shift to pay-for-performance, wherein REDD+ payments are made to governments or other relevant stakeholders once they demonstrate verified emissions reductions through avoided deforestation. 202 Payments, in other words, are tied to and timed with delivery of quantifiable results. This shift is important for creating a financial push to rectify governance and market barriers, to implement critical policy reform, to start realising emissions reductions in the near term, and to start getting funds flowing to the people living in and around forests whose land management practices need to change. Another example with potentially significant impacts is Indonesia, which has begun implementing land use policy reforms and law enforcement efforts following a major results-based REDD+ agreement with Norway. The forest conservation measures resemble those that led to success in the Brazilian Amazon, and represent a major policy shift. 208 For recipient countries such as Indonesia, key benefits of such agreements include reinforcement of high-level political commitment, internal discipline, and the multiple benefits of increased confidence in the rule of law resulting from a transparent, results-based agreement. The Forest Carbon Partnership Facility, managed by the World Bank, has set up a carbon fund to pilot REDD+ payments. So far, eight countries have been included in the pipeline, with six more to be considered in the coming months. Donors are increasingly applying a similar approach bilaterally. Germany signed its first contract with the state of Acre in 2013 under its promising new REDD Early Movers programme, which emphasises paying for emissions reductions through existing national mechanisms for sustainable development. For REDD+ financiers, benefits of the pay-for-performance approach include greater transparency, more accountability, and increased confidence that their investments are achieving more immediate impact. For the receiving country, key benefits include reinforcement of high-level political commitment; internal discipline; increased transparency of forest loss and what drives it; mobilisation of new internal constituencies, such as indigenous peoples and local communities advocating reforms, and the multiple benefits of increased confidence in the rule of law. This approach can also offer a welcome source of revenue to local communities and local governments. A number of international financing streams are available to support REDD+. One assessment estimated that donors from 15 countries and the European Commission had pledged about US$4 billion for 2010–2012 (about US$1.3-2 billion per year); US$2.5 billion of this has been pledged for future payments pending performance. 209 Other studies indicate total pledge figures in the US$3 billion range. 210. But to sufficiently secure the world’s forest capital and meet the challenge of climate change, much more REDD+ funding will be required, for capacity-building and increasingly for payments for performance. The Stern Review, for instance, estimated that the opportunity costs of forest conservation in eight countries responsible for 70% of land use-based emissions in the early 2000s were US$5 billion per year. 211 The Eliasch Review estimated the cost of achieving a 50% reduction in global deforestation by 2020 via carbon markets to be US$11–19 billion per year. 212 This estimate is likely to be too high, since it assumed paying the global market price and the need to cover full opportunity costs. Yet these figures serve to illustrate the discrepancy between need – however estimated – and current availability of funding. The international community has agreed on the rules for REDD+, including results-based REDD+ payments through the Warsaw Framework. The key remaining question is how to generate the demand for emission reductions to mobilise sufficient finance. Options include carbon markets, a results-based REDD+ window in the Green Climate Fund (assuming it is sufficiently capitalised), 213 or countries deciding to count emission reductions from REDD+ as part of their “nationally defined mitigation contributions” to the climate agreement (or as an additional international mitigation commitment). With a clear signal for the post-2020 period agreed as part of the Paris agreement in 2015, donors could potentially cover the scaling-up of results-based finance for the remainder of this decade. But clear policy is urgently needed for the next 15 years. Governments and their development partners should commit to and start restoring 150 million ha of degraded agricultural land through scaled-up investment and adoption of proven landscape-level approaches, including improved soil and water management. The recommended amount is equivalent to restoring 12% of degraded agricultural land by 2030. 214 This will require working with farmers, farm groups and the private sector. Where infrastructure and cross-farm externalities are big issues (e.g. China’s Loess Plateau), launching 20 new intensive projects per year, spanning 1 million ha globally, for the next 15 years could be achieved with US$1 billion per year in new investment. Where farmers can directly recover benefits from their own actions (e.g. the Maradi and Zinder regions of Niger), with supportive policies and extension services, farmer-managed natural regeneration could restore another 9 million ha per year, or 135 million ha cumulatively – a significant share of which would be landscapes incorporating agroforestry. 215 By year 15, the combined 150 million ha of restored agricultural lands could provide US$30–40 billion/year in extra smallholder income, additional food for close to 200 million more people, more resilient landscapes, and an additional 2 Gt per year in sequestered CO2e. Multilateral and bilateral funders, as well as foundations, should sharply increase finance for climate change adaptation, prioritising the poorest farmers in countries that are exposed to significant climate hazards and lack credible access to infrastructure, alternative employment, and risk insurance mechanisms. Specific instruments to support include infrastructure, institutions and programmes that help smallholders to invest more fully in their own market-oriented agricultural activities in the presence of rising climate risks. An example is the African Risk Capacity fund (ARC) recently launched by the African Union at a US$200 million level, covering drought insurance in Kenya, Mozambique, Niger, Senegal and Mauritania – an innovative pilot in risk pooling across regions of Africa. Similar interventions may be useful in remote rural areas in other parts of the world, where adaptive capacity is also low. Bilateral donors, foundations and national governments in developing countries should collectively double the financing of crop, livestock and agro-forestry R&D in developing countries from US$15 billion in 2008 to US$30 billion in 2030. The additional funding should target higher-yield and climate-resilient agriculture opportunities, and assess added value for carbon sequestration and biodiversity in the process, as in “climate-smart” agriculture. This includes (but is not limited to) stakeholder-coordinated funding through the Consultative Group on International Agricultural Research (CGIAR), which currently amounts to US$1 billion per year. Governments should phase out direct agricultural input subsidies, and redirect the savings to support the efforts described above and to provide more direct support to low-income farmers. Input subsidies – including on the order of US$46 billion in input subsidies in China and India and US$32 billion in input-based payments to farmers in OECD countries, among many others – reduce efficiency where inputs are overused, and add to greenhouse gas emissions, particularly when directed to nitrogenous fertiliser and electricity subsidies for pumping irrigation water. Input subsidies may still be appropriate, however, as temporary solutions to specific market failures or to help farmers in the poorest countries deal with global shocks. Nations and companies should commit to reducing the rate of post-harvest food loss and waste by 50% by 2030 relative to present levels. Governments that subsidise or mandate the use of biofuels should phase out these interventions to the extent that they involve food crops. If biofuels are considered important to meeting climate and/or energy policy goals, policies should focus on supporting the development of second- or third-generation biofuels using feedstocks that do not compete in major ways for productive land and fresh water. If the purpose of the policies is to boost rural incomes, the funds can be applied to other measures that do not put as much pressure on land and freshwater resources. Governments, companies and trade associations should commit to eliminate deforestation from the production of agricultural commodities by 2020 and halt the loss of natural forests globally by 2030. This target should be achieved in a manner that contributes to improved livelihoods of forest-dependent people. It builds upon progress already being made by some forest-rich countries and momentum started by the Consumer Goods Forum and the Tropical Forest Alliance 2020. Achieving it will require leveraging many promising seeds of change. For instance, advances in agricultural productivity (both on the supply and demand side) will be needed to satisfy food needs on existing agricultural land. Likewise, improved land use planning, REDD+ finance, technology-enabled transparency, zero-deforestation supply chain models, secure tenure, and better law enforcement all have a role to play. Developed countries should aim to provide at least US$5 billion per year in REDD+ financing (focused increasingly on payments for verified emission reductions). This amount is at least a doubling of current annual financing of REDD+ and is beyond whatever funding is provided by carbon markets.217 There needs to be a shift from the current focus on capacity-building to incentive payments for verified emission reductions, recognising that some countries may still require financing for readiness and preparatory activities. Financing for REDD+ is an essential part of international cooperation and burden-sharing on climate, particularly since forests are providing a global public good by absorbing and storing carbon. It helps governments that are determined to protect national forest capital, but that also worry about the livelihoods of people living in and near forests and the interests of formal commercial enterprises. Governments should commit to and start the restoration of at least 350 million ha of lost and degraded forest landscapes by 2030. We assume the population growth rate to 2040 to be 0.86% per year, following the UN’s medium-variant estimate to 2050. Similarly, the urban population is projected to grow about 1.6% per year over this period, and this can be used as a proxy for growth of the middle class to a lower bound of 3 billion. An upper bound is derived from an OECD estimate of 4.9 billion middle class people in 2030. The central tendency of 4 billion seems reasonable, recognising the uncertainties in predicting global household income distribution patterns 15 years in advance. The IFPRI source reports the number of participating households as 1.25 million, although this may include some in Niger from outside the Maradi and Zinder regions, and a million is a more reasonable approximation. Roberts, M. J. and Schlenker, W., 2013. Identifying Supply and Demand Elasticities of Agricultural Commodities: Implications for the US Ethanol Mandate. American Economic Review, 103(6). 2265–2295. DOI:10.1257/aer.103.6.2265. Spracklen, D.V., Arnold, S.R. and Taylor, C.M., 2012. Observations of increased tropical rainfall preceded by air passage over forests. Nature, 489(7415). 282–285. DOI:10.1038/nature11390. Kaimowitz, D., 2003. Forest law enforcement and rural livelihoods. International Forestry Review, 5(3). 199–210. DOI:10.1505/IFOR.5.3.199.19146[ii] Stevens et al., 2014. Securing Rights, Combating Climate Change. WWF, 2012. Chapter 4: Forests and Wood Products. Minnemeyer, S., Laestadius, L., Sizer, N., Saint-Laurent, C., and Potapov, P., 2011. Global Map of Forest Landscape Restoration Opportunities. Forest and Landscape Restoration project, World Resources Institute, Washington, DC. LINK They estimate that there are 2.314 billion ha of lost and degraded forest landscapes around the world (relative to land that could support forests in the absence of human interference; precise data and interpretation confirmed by map author Lars Laestadius, 14 August 2014).